An april is a perfect time to prepare for summer days! So today we are ready to share with you gorgeous ideas with satin shorts. If you wanna something elegant and chic, then you should find a pair of shorts from this fabric, for sure. Of course, at first, you need to think about a type of shorts. So you are free to pick up any styled ones from high-waisted to ruffled, from bermuda to belted ones. Secondly, you should choose a color for your new item from basic such as black, beige, gray or navy blue to eye-catching ones, for example, orange, red or emerald. Right now you can scroll down and consider all collected ideas. Get inspired and enjoy! 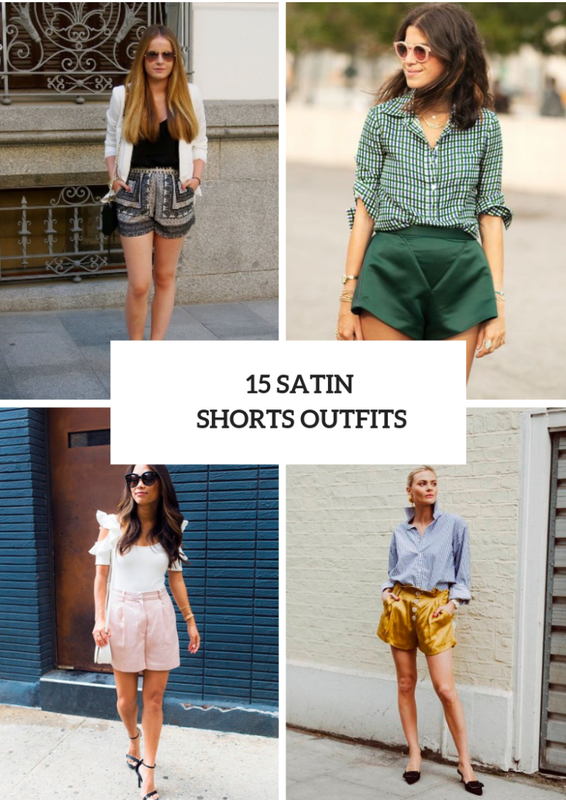 Many fashionistas make awesome relaxed outfits with satin shorts, so you can try to create them too. 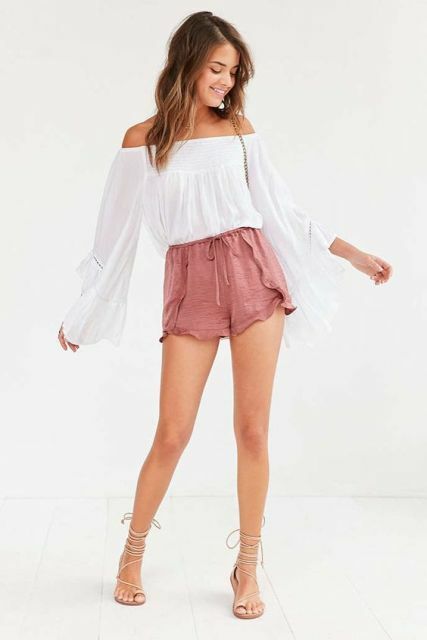 For example, you can take a white boho chic off the shoulder blouse and combine it with pale pink satin shorts, a chain strap bag and lace up flat sandals. Or you can mix these shorts with a black one shoulder loose top, a black embellished leather bag and black and white sneakers. Don’t be afraid to pair satin shorts with more official button down shirts. Just try tot repeat a look with a striped oversized button down shirt, yellow satin shorts and black kitten heel mules, and voila — you will get a very fashionable and comfy outfit! Sometimes you don’t even need unique pieces of clothes to look amazing. Just take a white button down shirt and mix it with a white blazer, navy blue satin shorts and beige pumps. Or choose a white loose shirt and combine it with a black blazer, a printed bag, gray shorts and white ankle strap high heels.